Steve Cameron: Science Fiction & Fantasy Author: Paradise, Oh Paradise. So there I was, walking down the main street in Rye when I saw a sign outside a venue listing all the live music that was playing there over the next few nights. 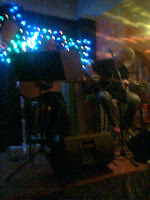 I was thrilled when I saw Mick Pealing Duo for the following night. Back in the late 70s, my friend and I used to spend a lot of time together listening to music. In particular we played lots of Fleetwood Mac, The Police, Blondie and Stars. One of my favourites was the latter's Paradise album. A brilliant mix of country, rock and blues, the album still holds up and doesn't sound dated - no mean feat after 33 years. In fact it was only last week that I played it at home. So to see Mick Pealing in a small venue while on holiday was thrilling. I asked a friend to join me - not that he needed his arm twisted - and I must say I was blown away by Mick. He sounded wonderful, and I thought voice was as pure as it was on that first album. Playing mostly covers, with Steve Wade (spent some time in LRB, I believe) on guitar, they held the small but enthusiastic audience in the palm of their hands. I was emotionally moved when they played Look After Yourself and Back Again. And they were very approachable. I was able to chat to both Steve and Mick (Sorry guys if I was annoying, but you said all the right things) and even request a song. And for me, that request turned out to be a highlight. In fact my friend agreed The Last of the Riverboats never sounded better. And to the young fellas there that left after a few songs because they didn't play Khe Sanh just because you kept calling it out, next time check out the heritage of these guys, stick around and learn something, and enjoy the music they did play.